MANILA, Philippines, December 6, 2012 (ENS) – A ferocious typhoon with intense rain has claimed 325 lives in the Philippines and injured more than 400 other people. Hundreds more are missing and nearly 200,000 are homeless tonight. Typhoon Bopha, known locally as Typhoon Pablo, is packing central winds of up to 120 kph (74.5 mph) and gusts of up to 150 kph (93 mph), now is moving west-northwest of the Philippines and will blow across the South China Sea on Friday. More than 700 kilometers in width, Pablo walloped the island of Mindanao on Tuesday and Wednesday, laying whole towns to waste with hurricane-force winds, floods and landslides. Pablo is forecast to move west northwest at 13 kilometers per hour and is expected to be 600 km west of Metro Manila Friday evening and outside Philippine territory by Saturday evening. The National Disaster Risk Reduction and Management Council, NDRRMC, reported Thursday that most of the fatalities were people who drowned or were pinned by fallen trees or collapsed houses. The Council said only 73 out of 325 people killed have been identified so far. A “miracle” survivor was rescued Thursday after being stuck for two days under rocks and debris in floods that obliterated his whole family and their village of banana and coconut farmers. Carlos Agang, 54, told reporters, “It’s a miracle that I survived, but I might as well be dead,” as he was carried on a stretcher to be airlifted to a hospital for treatment of a broken leg. Agang is just one of over five million people affected by the storm in 29 cities and 188 municipalities. At least 310,600 people are receiving emergency assistance both in evacuation centers and outside, according to the NDRRMC. Thousands of people lost power, although utilities have been restoring power throughout the day. Seven bridges and 12 roads were so damaged as to be impassable; the water supply in San Francisco and Poblacion Esperanza, Agusan Del Sur has been disrupted. President Benigno S. Aquino III said on Wednesday that there are “sufficient funds” from which affected regions can draw to pay for “necessary expenses and emergency infrastructure” such as damaged roads. Speaking to reporters at the sidelines of the League of Municipalities of Philippines General Assembly at the Manila Hotel, President Aquino announced the availability of P8-billion (US$194.5 million) for immediate distribution. The President said that the funds come not only from the government’s calamity fund but alsos “revenues from unexpected sources” such as the recent government sale of the Food Terminal complex in Taguig City. “So Secretary Florencio Abad informed me last night that there is at least P8-billion ready to take care of all of the necessary expenses here and also in the necessary emergency infrastructure,” President Aquino said. The President repeated his appeal to Filipinos to heed storm warnings and evacuate if ordered to do so by local authorities. 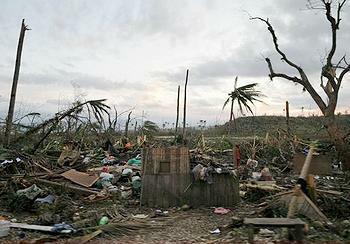 About 20 typhoons strike the Philippines every year, resulting in death and destruction. 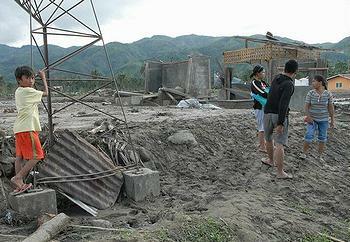 Almost exactly one year ago, Typhoon Washi killed 1,500 people in Mindanao.